One only has to look at the number of stores selling storage products and solutions - everything from crates to boxes to multi-drawer and more - to know that storage is a big issue in most homes! We can all agree that the kitchen is the heart of the home, but nobody wants a deurmekaar heart or to gather around in utter chaos. As high-volume spaces it's easy for kitchens to become quite chaotic, but with a couple of smart interventions your kitchen could be one of the most functional and well organised spaces in your home. "Start the organising by thinking beyond the obvious when it comes to space. Consider the space between the fridge and the wall (could the ironing board live there?) or is there room between the top of the cabinets and the ceiling? It's ideal for storing things you don't use every day but don't want to get rid of, like picnic baskets, ice buckets and vases," Liebenberg suggests. She adds: "If you fancy a bit of DIY you could elevate your organisation from so-so to superb by installing roll-out shelves, ideal for storing condiments and canned foods in a very space-efficient way." Good organisation is also about optimising what you already have and that doesn't seem like a storage solution in itself. For example, how about making use of the inside of a cabinet door by placing adhesive hooks inside to hang cutlery and kitchen utensils. 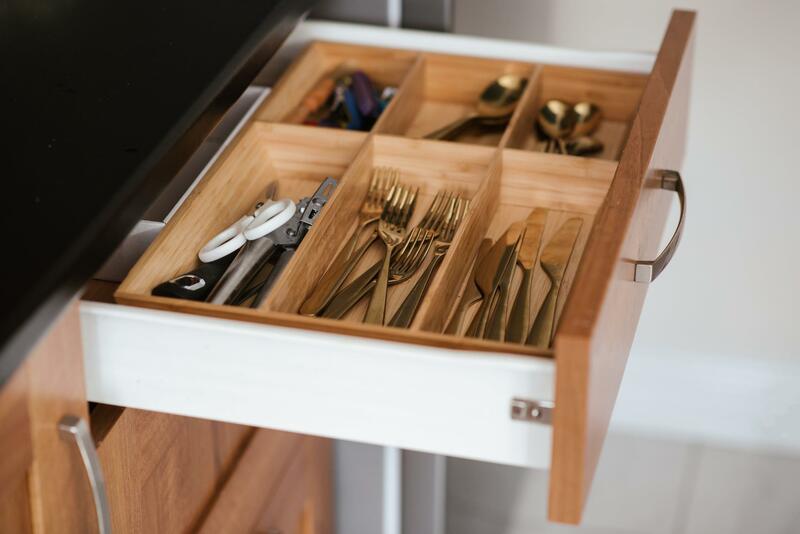 "Simple interventions like placing wooden or plastic dividers into drawers to neatly organise the things inside can do a lot for one's sanity!" Liebenberg points out. Magazine racks too are storage heaven! You can mount these virtually anywhere to store plastic wrap, paper towels and cutting boards. Use stackable storage bins for deep cabinets, especially those beneath the sink, and neatly label them so that you can avoid frantically unpacking everything to find that ONE item. And who ever said plastic shoe holders were only made for shoes? Use these low-budget carriers to store fruit and veggies so they don't roll around on the countertop. The bathroom is usually the first and last space in the home that we use each day. It is also where we clean ourselves up and get ready to face the world, so what could be better than a neat, organised and clutter-free bathroom (a clutter-free bedroom and kitchen... see above and below!). And we're not talking about picking up the wet towels on the floor - that's goes without saying. No, we're talking about the little things like tweezers and hair pins that don't have a home. "A magnetic strip mounted to the wall above the sink is a great way to storage odds and ends in one easy-to-reach place. Too many towels and too little rod to hang them? Rods are inexpensive and easy to install so no excuses there," Liebenberg suggests. Short on cabinet space? Invest in a slim storage cart to fashionably store your facial products, make up, and oils. You can separate them into jars, baskets or colourful containers to add a touch of variety to storage. A bathtub caddy is a bathroom must-have. Opt for style that suits the look and feel of your bathroom, it could be stainless steel, wood or even a high-quality plastic, for easy access to all your bath and shower goodies, like soaps, bath salts, facecloths and cosmetic products. Whether you live in a big house or small flat, keeping your sanctuary clutter-free is an absolute must for serenity and a great night's rest. Nobody wants to be falling over bags and shoes is their own sanctuary. Some easy tips and tricks for maintaining order include keeping accessories likes belts, wristbands and headbands neatly stacked on a paper towel holder. If your cupboard is bursting at the seams consider making use of S hooks to hang tops and pants as a means of taking up less room than conventional hangers, Liebenberg advises. Sit and store by making the ottomans in your bedroom serve a dual purpose. Pop the lid and voila - it turns into a mini shoe closet or linen box. Style and function in one! Storage doesn't have to cost the earth - or the price of a bigger property. By simply being smart about it anyone can easily create order and a clutter-free home. Happy sorting and storing!